For years, Optum provider marketing relied on “one-and-done” campaigns. Although it was effective, a fresher content perspective was needed, along with a different way to promote it. 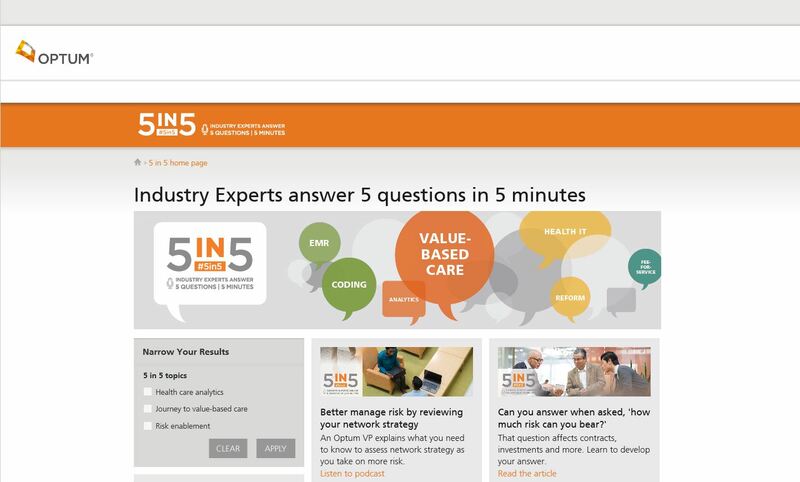 Evolution came in the form of the “#5in5 – Industry Experts Answer Five Questions in Five Minutes” campaign, Optum’s first large-scale, integrated thought leadership campaign that uses social media as the primary delivery channel. See how the team revolutionized interactions with customers through leveraging social media. This case study is a Reader’s Choice nominee for the MarketingSherpa Summit 2017 Awards, the last of four that have been published over the past month. Optum was chosen by our panel of judges for the team’s enthusiasm for providing customers with relevant conversation in weekly content that allowed the company to educate and nurture. The team then evolved how they interact with customers on social channels in order to promote that content, capitalizing on new customer discoveries. Please visit our blog on Monday, September 12 to vote for the Reader’s Choice Award. Optum marketing strategists work with internal and external creative teams to map their content to the persona they are targeting, according to Leslie Cozatt, Director of Marketing, Provider – Thought Leadership and Content Strategy, Optum. “Content is based on persona research conducted by Optum that indicates how key decision-makers view their role, what pressure points exist within their organizations, what goals and issues drive their decision making and what messages and materials will resonate,” she said. For years, Optum provider marketing relied on “one-and-done” campaigns that leveraged its extensive library of thought leadership content, according to Cozatt. 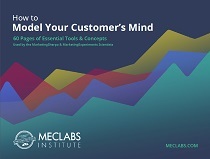 The company turned to social intelligence research to determine how, when and why its key audiences and industry thought leaders consume and use information. From that research, the team realized the power social media holds over information delivery, Cozatt said. She and her team decided to combine the wide reach of social media with its thought leadership content. This came in the form of the “#5in5 – Industry Experts Answer Five Questions in Five Minutes” campaign, it is Optum’s first large-scale, integrated thought leadership campaign that uses social media as the primary delivery channel. At its core, Cozatt said, #5in5’s objective is showing Optum how specific target audiences use social media to educate themselves about challenges and opportunities facing the health care industry. The #5in5 campaign aimed to meet target consumers on their turf, sharing timely, relevant news and information, and join their conversations to discover what they want to know, according to Cozatt. 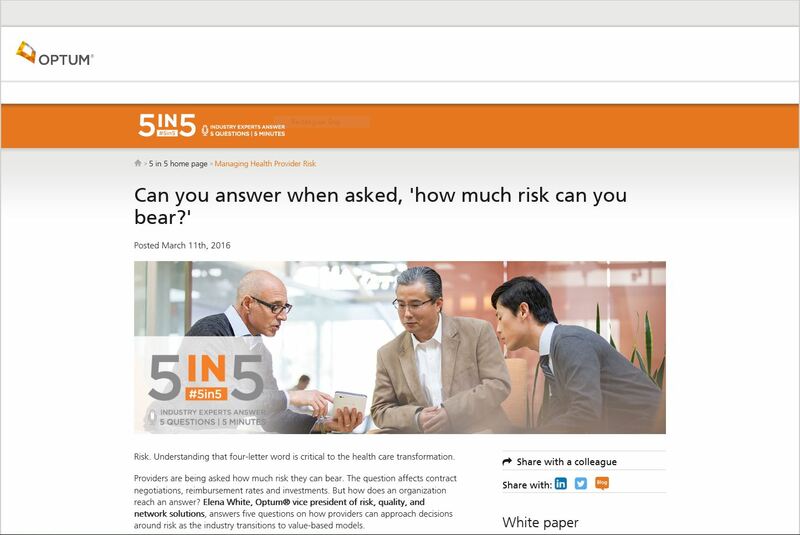 The #5in5 campaign was designed as a large-scale, long-term integrated content marketing campaign focused on topics that the Optum provider market was interested in: analytics, value-based care and risk enablement, according to Cozatt. The social aspects of the campaign ultimately directs users to gated information such as case studies, white papers, infographics and videos. The gated pages collect information and auto-enroll the prospects in the appropriate lead-nurture campaign. The company pulled contact information on 9,500 prospects from its primary analytics product lead nurture campaign database, in order to learn more about its target audience. Key thought-leading accounts that shared content similar to #5in5 were sought out, as well as accounts that looked like their current database contacts, in hopes Optum could develop these new accounts into potential leads. The team then mined Twitter and LinkedIn for information on these accounts, uncovering key topics, conversations, shares, hashtags, and key influencers and targets. Upon embarking on this, they weren’t even sure if their target customers were in these spaces. “This is the C-suite of hospitals and hospital systems. Are they on Twitter? Are they using LinkedIn? Will it work? And the results from that gave us enough information to tell us that it was viable and we should pilot it, we should test it and see how it worked,” Cozatt said. Less than two years ago, she added, Optum had virtually no social media identity. Sites like Twitter, LinkedIn and Facebook were used to deliver unidirectional promotional messages, she said, whereas now they’re used to raise that social identity with customers by monitor and joining conversations on important healthcare topics. “The goal was not only to participate with the existing prospects by engaging in their conversations and delivering relevant content at the right moment, but also to establish a path to engage look-alike prospects on the social channels to generate new leads,” Cozatt said. The original site was built with the idea of creating “episodes” for the #5in5’s on a relevant topic. An Optum or an external subject matter expert would be interviewed, sometimes in the same session so a lot of content could be created at once. The episodes go live every Tuesday in the form of either a video, podcast or article — along with a minimum of three topic-related online resources, links to curated news articles and gated Optum thought leadership content. “That’s difficult. It's not easy to create a full content package with a new, unique piece of content, links to other pieces of content and curated content, every week,” Cozatt said. #5in5’s are given away for free, and not gated, but are aligned together. Traffic can be driven to a specific episode or topic, or a generic #5in5. Targets might see a prompt that reads along the lines of, “Interested in listening to subject matter experts answer five questions in five minutes? Click here.” Then, it takes them to a landing page where they have a whole library to select from, or they can drive them to a specific topic. “It could be new or existing content, but it allows us to leverage our whole library of thought-leadership content, along with new things that we're creating all the time … And then we use the blog and social media channels – a combination of paid and organic – to drive traffic to the 5 in 5,” she said. Once on that episode landing page, directly next to the #5in5 there are links to gated content, where leads are collected. “We have levers in this campaign like you wouldn't believe. Everything is tracked. So we know where they came from, how they got there, how did they navigate their way through, what did they consume once they got there, how many pieces of content, on what topic, and based on what they're downloading, that determines what existing lead nurture campaign we feed them into,” Cozatt said. If someone focuses on analytics-related content, for example, “they go into our Game Changer campaign. If it's risk-related content, they go into our RM campaign. If it's generic value-based content, they go into our Journey campaign. And if we don't know, we put them in our Executive Lead Nurture campaign,” she said. Simultaneously after publishing, promotion begins for a #5in5 episode. Supporting content is posted to social channels including LinkedIn, Twitter and Facebook, as well as Optum’s Health Care Conversations blog, according to Cozatt. LinkedIn, Twitter and Facebook are the primary outlets for the social messages, she said, and everything from these social channels drives to the #5in5 episode landing pages. For social promotion of blogs, Optum marketing leaders’ Twitter and LinkedIn accounts are also utilized, as well as the official @Optum_Provider handle. @LeslieCozatt, for example, averages at least 25 link clicks through to #5in5 content per day on her Twitter account. She also has top healthcare blogs, health news sites and other thought leaders following her account. Monitoring of these channels isn’t something that was only done at the beginning, but continued in order to determine how to nurture leads and target prospects. That information is also used to find similar users to generate additional leads. “That’s taken some time, and I would say that we have not perfected it, because we continue to tweak, and we continue to see what works better than other things and identify new opportunities for ways to promote,” she said. More tracking links are continually being added, she said, and the data feeds automatically into reporting system dashboards. “Probably the hardest part of it was just getting it set up … Now that we have it set up, the numbers just feed in automatically. And they all roll up to a dashboard that gives me a high-level view. So I can look month over month. I can look at the topics that are relevant,” she said. That process helps them hone in on what is most important, because, “it's an overwhelming amount of reporting, and it comes from a lot of different sources,” she said. The #5in5 campaign is picking up momentum at a great pace, she said. “Each week brings more interactions and engagement with content,” she said. Because of this success, Optum is working on several enhancements to the #5in5 campaign. 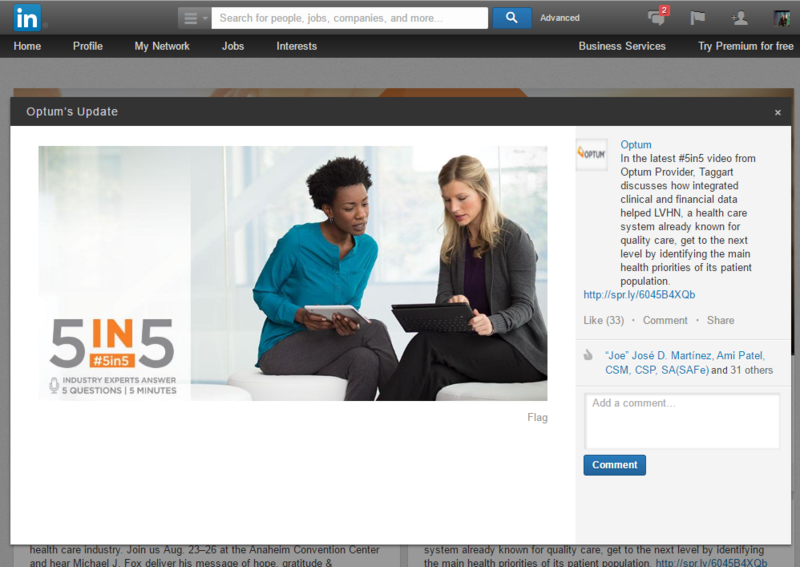 For instance, the team has migrated to a new mobile-friendly Optum.com website, and a new #5in5 site as well. The team also wants to bring in more internal and external subject matter experts, while also soliciting content ideas from users. This expansion even includes integrating the campaign into events, by having on-site interviews conducted at industry events. 321 tweets received 4.1 million impressions, 6,548 clicks and 19,484 engagements. Cost per click fell from $13 in November to $5 in April. 36 posts received 856,158 impressions, 3,177 clicks and 2,875 engagements. Cost per click fell from $4 in November to $2 in April. A #5in5 LinkedIn clickthrough rate is 0.59%, whereas the average is 0.25%. • Organic email activity: 164,000 emails, 23,000 opens, 14% open rate, 1% click-through rate. • Paid email activity: 18,500 emails, 4,300 opens, 23.9% open rate, 3.9% click-through rate. leads, there is an average of 3.5 minutes spent on site. This was Optum’s most integrated thought leadership content campaign to date, Cozatt said, and with that, #5in5 had the potential to be the most complex and challenging to produce and execute. “The opposite has been true. Because Optum started with a foundation of clear goals, a detailed communication plan, digestible content, responsive templates and defined roles this campaign has been the most efficient and scalable integrated thought leadership campaign launched to date in the entire Optum organization,” she said.